Coolibar, the industry leader in sun protective clothing, is DETERMINED to change skin cancer and melanoma statistics. On Monday, May 7th, Coolibar revealed a limited-edition t-shirt in support of their mission to keep the world safe from sun damage. Proceeds from the sale of this commemorative t-shirt, inspired by a 10-year-old child whose brother was diagnosed with a rare form of pediatric cancer, will go directly to the Melanoma Research Foundation in support of research, education and advocacy. This shirt represents the love, courage, fight and commitment shared by everyone who is impacted by the far-reaching diagnosis of melanoma. 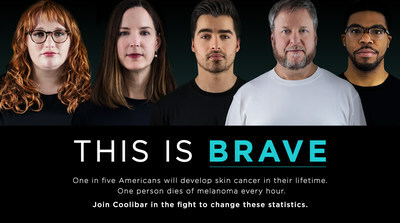 To heighten awareness, Coolibar launched This is Brave, a campaign depicting the real-life stories of skin cancer and melanoma warriors including Norah O’Donnell, Brian McKenna, Janet KJ103, and Bethany Greenway. Determined to spread the message to prevent skin cancer through early detection and education, each journey brings this immoderate disease to life in the author’s own words with captivating photos. Encompassing hope, perseverance, and advocacy, This is Brave is designed to invoke thought and prompt readers to take action, as skin cancer does not discriminate against race, age or gender and no one is exempt from this terrible disease. Join Coolibar in the fight by supporting the Melanoma Research Foundation with your limited-edition shirt purchase available online now. Feel good wearing UPF 50+ sun coverage in support of a great cause. From Thanksgiving through New Year’s Eve, many of us can struggle with the countless demands of making the holidays happy for others in our lives. We can experience joy in finding that perfect gift for someone special, or in creating the most delectably scrumptious treats wrapped in unique papers and ribbons. There are countless holiday concerts, parties, pageants and services intended to bring us closer to the spirit of the season. So much to do in so little time! As a psychologist, I frequently hear about the joys of the holidays. However, I also hear about how holiday preparations can create exhaustion, stress, and even depression. Below are a few suggestions for helping you make your holidays as happy as you make them for others. EXHAUSTION: SLEEP! Of course, that’s an easy one. Just SLEEP! Easier said than done for those with sleep visited by To Do Lists running through their heads and worries about the dinner where Aunt X sits across from Aunt Y with only a turkey between them. Maybe putting those To Do Lists down on paper could get them out of your head. Maintaining a sleep schedule could help regulate the body and brain to relax for sleep. Avoiding the use of caffeine, sugar, and alcohol, as difficult as that is in social gatherings, cutting back may help the exhausting energy swings. STRESS: Avoiding stress is difficult, but not impossible. Planning ahead, not overspending, limiting extra obligations, walking slowly instead of rushing rushing rushing might make all the difference. Overwhelming stress might lead to panic and anxiety or feeling a racing heartbeat, sweating, shallow/rapid breathing, headaches. You might consider taking care of yourself with a relaxation tape, a massage, a walk in the snow, a chapel prayer, or a quiet lunch with a good friend. Counselors and psychologists are trained to support your experience and help you practice stress-reduction techniques. DEPRESSION: Norman Rockwell has painted for us the perfect American family experience. We all hope our families will match his depictions, yet sometimes our family members don’t share our picture. If we have lost a loved one or are geographically separated from someone we love during the holidays, we may experience grief or depression. Some of the best anecdotes for depression are physical activity, gathering energy from being around others, putting in place distractions from depressing thoughts and monitoring sleep and eating. Since the holiday months also include gray skies and cold temperatures, Northeast Ohioans are prone to increased depression. Physicians, counselors and psychologists are available to help you knock out the winter and holiday blues. If you, or the children, adolescents, adults in your life need some support during the holidays, please contact us at Therapeutic Associates of Medina for psychotherapy, counseling, coaching, energy work, massage and Reiki. We are here for you at 330-607-1560.